The book will be free for the rest of this week. Special thanks to Ruben Bartelink and Porter T. Baer for feedback on the early drafts. Thank you. I like it. Very concise and to the point. 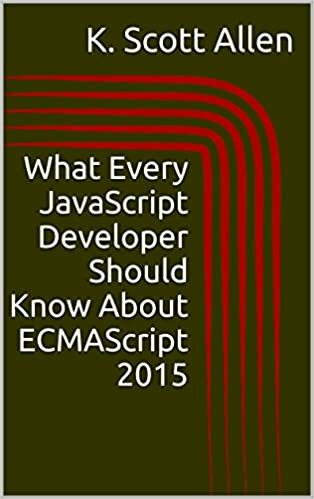 I'm looking to get a 'head start' from my peers and the ES6-7 who are still writing ES5 code, this will come in handy. I have read some of chapters, very short and concise. There are a few minor issues most notably to do with word spacing, some a clumped together and others are spaced really far apart, I am not trying to find fault, just thought I'd point it out. The code format and indentation seemed off as well. Thank you for your effort, it was a great short book to read and digest, I've learnt a few new tricks too. Keep it up Scott. Thanks! I have already spread the information to my colleagues! OK, here's the tough one: do you discuss module *loaders*? Or have a post on them anywhere? There seem to be roughly three types: - npm/browserify/babelify - webpack - SystemJS .. the closest to a standard. Are we entering "loader wars" or will whatwg, in charge of the loader/browser standard, eventually resolve the problem? *Any* help much appreciated. Thanks! 'The book will be free for the rest of this week. ', how do I download this?